One of the new product launches by Bliss Adventure for this winter were the e-fatbikes. 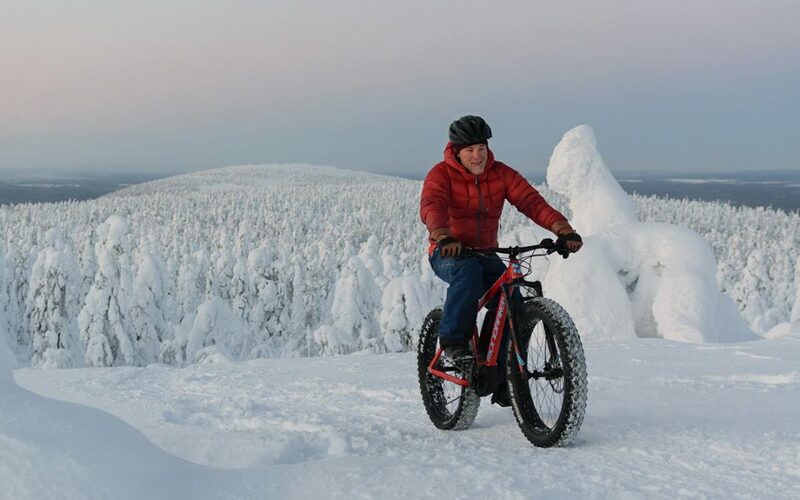 Electrically assisted fatbikes have won several hearts already and we can see why: they made it possible in a blink of an eye – also for the not-that-sportive ones – to fully enjoy exploring the Arctic taiga forest on a bicycle, without finding oneself out of breath. They also made possible to simply cover more mileage in the same time, to see more. This appears like a game changer for us. It is quite possible that we are a bit of gear-heads. We simply love good, well-made and reliable gear and equipment. The same applies not surprisingly for the bikes. That’s why chose the premium option, the Mondraker e-Panzer e-fatbikes. The e-fatbike fleet serves the best bike riders from 155 cm to 210 cm. For the even shorter riders, we have conventional muscle-powered, fatbikes, that are light to pedal. We dare to promise that an e-Panzer makes a seriously solid and fun ride. Hop on the saddle, join our guided tours in Pyhä-Luosto or rent one, grab a route map and go for a self-guided spin!